Today I would like share about my daily life in California. In this world, everyone is so busy and engrossed with their own lives and various social obligations and entertainments. Some people chase after wealth or material enjoyments, while others use their precious time to benefit other sentient beings. We are in the realm of the form of desires so naturally we crave satisfaction of the five pleasurable desires (sight , sounds, smell, taste and touch). Hence we are subject to much suffering in this realm of joy and sorrow which can only be alleviated through the practice of dharma. 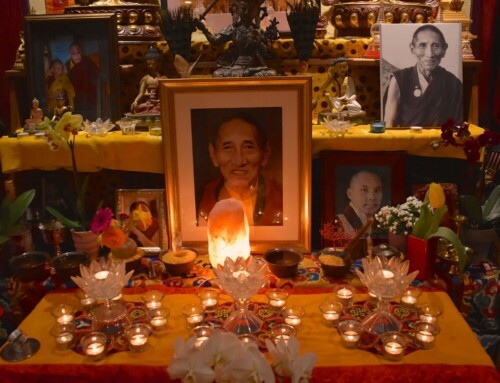 A good dharma practitioner will start preparing for their next life right here in this life. Hence I contemplate and think not only about this life but also about the next. I also make it a point to go for my annual one month retreat to renew and “recharge my batteries” so to speak. As I have many responsibilities here at Pacific Grove and around the world, I have to take time out to be by myself for my meditation practice. Unfortunately I did not have the opportunity to do my month long retreat for the past two years due to my tight schedule. It is very important to renew our meditation and practice daily no matter how far you have progressed in your dharma cultivation. We can then reap the fruits of our practice if we can maintain our awareness or mindfulness for six periods of day and night. That is why practice is so important. Although intrinsically we are different, basically we are all human beings wanting happiness of the mind and to be free from harm and suffering. His Holiness the Dalai Lama always used to say that his daily practice is to dedicate his body, speech and mind to all sentient beings. Since I am the student of His Holiness, I try to be humble at all times and also to follow his teachings and way of life. I try my best to dedicate my body, speech and mind to everyone I encounter. Compassion for others makes every mundane activity we do meaningful. When I first came to America, I noticed that everyone was so busy with worldly activities without any true purpose in life and time is just gone in an instant. 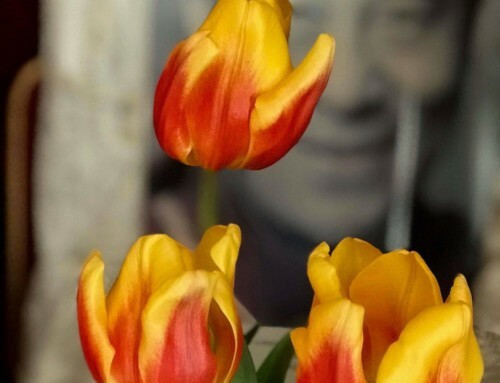 This precious human life should then not be wasted on meaningless activities but on cultivating the seed of bodhicitta for liberation for self and others within this lifetime. You will then be accumulating vast amount of merit when you lead your life benefiting others. The early morning is the time that I dedicate specially for my dharma practice. I do my daily prostrations and make water bowl, candle light and incense offerings at the altar. After which I will have my big American breakfast and I will rest for a little. I will then proceed to do my daily prayers and then meditate for 4-5 hours if I have the time to do so. I do not want to loose this precious time as mornings is the best time which is conducive for dharma practice since my mind is still fresh. 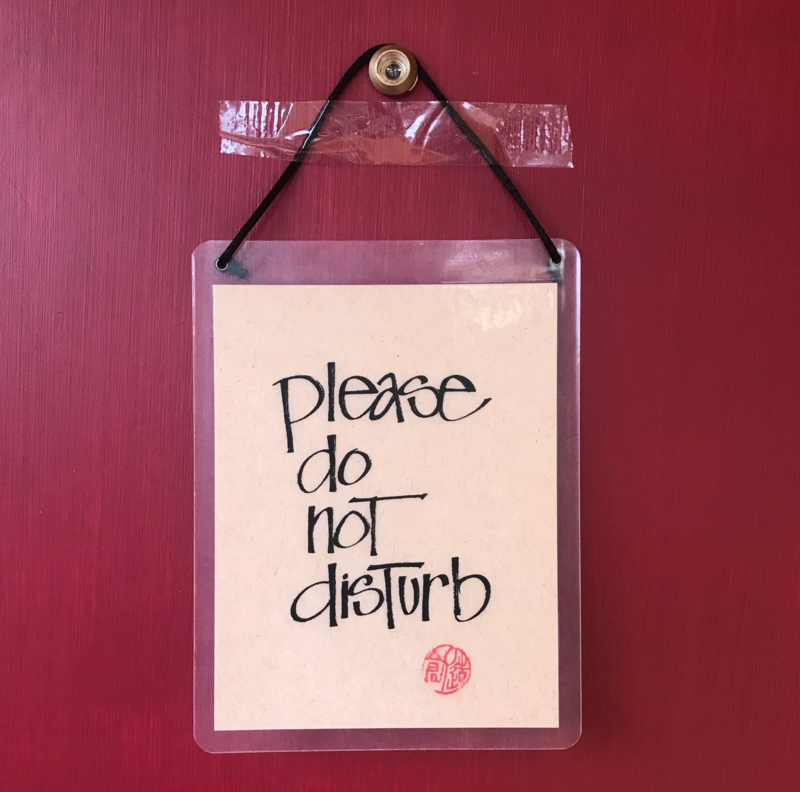 At times I will then hang this “Do Not Disturb” sign outside my front door as I do not want to disrupt my dharma practice or lose my meditative concentration. Also as this Dharma Center is near the main road, there will be lots of people who pass by just to say hi or knock on the door. Many are curious as to what place this is and ask if this is the place for yoga classes? Some knock on the door and ask what is dharma? I will then explain briefly that dharma is the teachings of Lord Buddha Shakyamuni and is the path that we must take towards happiness, by having the wisdom to completely discern the truth of our delusions and the way out of suffering. Of course, if you really want to be serious about dharma practice then this is the right place for you and everyone is welcome to join in. A dharma center is likened to a hospital where the teacher is the doctor, dharma students are the patients and dharma is the antidote or medicine for the mind. Dharma is so important to me as we all want happiness and peace of mind, and only dharma can make me really happy. Not only is dharma happiness important, I also really wish to help everyone including my Sangha (students) as much as I can. All beings within the six realms of Samsara experience suffering as Samsara is the very nature of suffering. 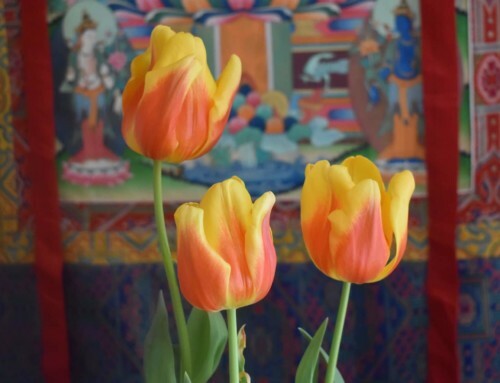 And as Vajrayana practitioners, we must practice with the intention to benefit all beings as wide as space. Above everything else, focus on this. When I was 23 years old, my second guru teacher was Khenpo Karma Tseten. He was 85 years old at that time. 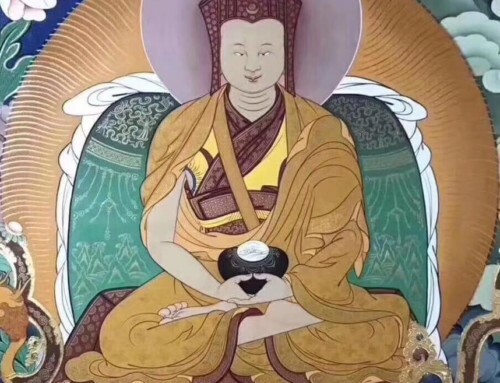 I had received many teachings from him and he always said to me “Lama if you really want to help others, you have to practice dharma yourself first.” For example someone is really thirsty and asked you for some water to quench his thirst. First you have to check your own cup to see how much water you have contained inside. Because if you gave away all your water, you will then have none left for yourself. How much water you have in your cup you can check and then simply just share it or drink it. In this analogy, water is the dharma and all beings are suffering of thirst due to the three poisons of attachment, aversion and ignorance. Another analogy is an example where your neighbor’s or maybe your family’s house is dangerously ablaze and engulfed in fire. You really want to go help put out the raging fire. But first you have to think about how you are going to help fight the fire. Do you want to go empty handed which is very silly and dangerous? This attempt might even bring you harm at the cost of your life. So then how do we help? We will need lots of water in order to fight and eventually put out the blazing fire. This big fire represents the flames of Samsara (birth, sickness, old age and death) and we experience intense suffering just like the fire. Dharma is then the nectar or the water that is necessary to put out this fire of pain and suffering. Samsara is an ocean of suffering and an endless wandering in cyclic existence but if we possess the precious dharma nectar of bodhicitta, loving kindness and compassion, then there will be no fire that we cannot extinguish. We will then be able to escape and transcend this wheel of Samsara. As dharma practitioners, we have to know how much loving kindness and compassion we have generated in the course of our practice. 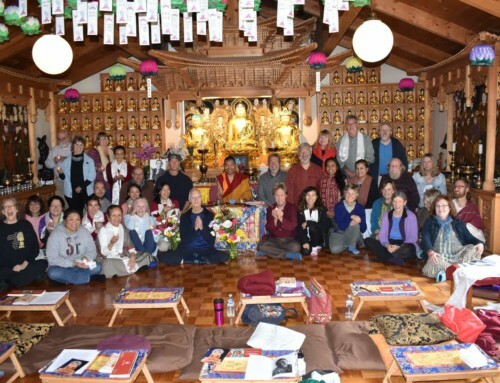 The essence of the 84,000 teachings of the Buddha is in fact loving kindness and compassion. All the six paramitas (paramita of generosity, discipline, patience, meditative concentration, diligence and wisdom) are included in that and if you have generated loving kindness and compassion in your mind-streams then all your worldly activities will be transformed. So then you will be accumulating virtue during all your waking moments, while working or buying the groceries and even while you sleep. So which level of Prajnaparamita (perfection of wisdom – “Tayatha Gate Gate Paragate ParaSamGate Bodhi Soha” are you at? Are you still at Tayatha or past the “Gate” or beyond? There are altogether ten grounds (stages) and five paths of the Bodhisattva path to enlightenment. The five paths being the path of accumulation, the path of application, the path of seeing, the path of meditation and finally the path of no more learning. Are you still at the level of sentient being or Arahant or Buddha or Bodhisattva? If you are still at the level of a normal sentient being then how can you help others go beyond the shores of Samsara? You cannot help. For example, there are two people who wish to cross the river but unfortunately the river is too wide to cross. They break down to cry as they can’t help one another since they are both heavily burdened with the weight of afflictive emotions and attachments in the great ocean of Samsara. When things are good, send it out to all beings. May the benefit and bliss fill all of space! May the ocean of samsara be dried up! That is why it is of utmost importance that you have to practice first. I always think that since I am the teacher, I have to set a good example for all my dharma students. It doesn’t matter if they choose to follow me or not but I should first set the example. If the teacher and the student are always on the same level then how can the teacher help the student to progress on the path? That is why my daily morning practice time is so important to me. Everyday after 1:00 pm I will go to the beach for a walk and then come back home for a late lunch. There are days where I will have dinner in the evenings with my students in Big Sur or visit some sick patients in the hospital elsewhere. I do not take dinner but sometimes there will be important things I will have to do. Most times I will stay home to read or meditate on impermanence and also reflect on what I have done for the day. Of course there will be also be the usual Monday night Amitabha Puja/Teachings at 6.30 pm and Saturday morning meditation sessions at 10 am. Therefore, everyone please study, contemplate and put this into practice. Dharma is not just hearing or studying but Dharma must merge into the depths of your heart. Not only must Dharma connect to your body and speech, Dharma must also be linked to your mind at all times. Only then can the timeless and unconditioned Dharma be an antidote to your delusions. If Dharma strikes the right point you don’t have to know many teachings for it to captivate your heart and mind. The smallest practice of Dharma can definitely transform your mind. Therefore I wish that everyone can practice the Dharma diligently so that you can have a more refined understanding of the dharma. Some students may say “I have studied for so many years and I have also been here at the center for eight years but I am still the same person. What happened?” Of course, without practice there will be no results. No pain no gain. So in summary you have to continuously practice dharma everyday without disruption just like the river that flows unceasingly into the great ocean.